How to Tune a Guitar? – Sound Check Lab. Guitars tend to drift out of melody as their strings loosen. Thus, if it is your first time to use a guitar or planning to buy one, learning how to properly tune a guitar should be your first priority so that your instrument will sound great. Actually, tuning a guitar is not as difficult as what you are thinking. With basic knowledge and proper research, you will be able to tune your guitar perfectly. However, if you’re having a hard time doing this job, don’t worry because we’ve got you covered. In this post, we have compiled two of the common ways or methods that are usually used in tuning a guitar these days. 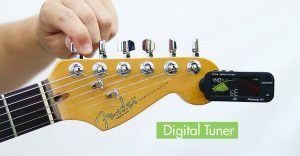 Nowadays, there are myriads of types of guitar tuners where you can choose from. You can use either a handheld tuner, clip-on tuners, tablet or smartphone tuner app, or pedal tuner. However, tuning a guitar using a tuner is pretty easy and we will show you how. Before performing the steps below, make sure to set the tuner to A 440Hz first most especially if it has a calibration setting since this is the normal tuning frequency. But if your tuner doesn’t have this setting you can start with the first step as long as you are ready. First Step. Get every string to the right note name. For example, if you are tuning the low E string, make sure to acquire the note to an E first. Second Step. When your tuner is showing off the right note name for the guitar string you are on, you may tune the note by whirling the tuning key slowly ‘til the tuning needle is positioned in the center. Third Step. Once you have finished tuning all the strings, go over them once again. Note: If you are tuning an acoustic guitar, altering the tension on the strings may possibly alter your guitar since it is made from wood. 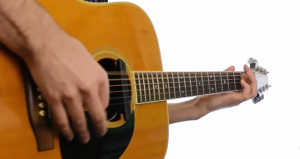 Here’s how to tune a guitar using its own strings as well as your ears. Start this method by tuning the sixth string as precisely as you can to a low E. However, this does not need to be faultless. Simply guess what the densest string typically sounds like. Remember that, the remaining strings will be modified relative to this, it does not actually matter if it is a bit flat or sharp. Put your first finger on the 5th fret of the thickest guitar string. In fact, this offers you an A note which will sound just like how you want the fifth string to sound. At this point, you can tune the fifth string in order to counterpart the note you’re holding on the sixth string. Further, pluck the open fifth string and 6th string in turn gently, by keeping your finger on the 5th fret. During this step, you need to pay attention to the sound since the notes reverberate as soon as they match. In this step, we are going to make the same thing, but a string higher. Put your first finger on the 5th string’s fifth fret to make a D note. Then pluck the fifth string and the open fourth string interchangeably and turn the machine head of the fourth strings ‘til the 4th open string’s note sounds similar to the note of the eth string’s fifth fret. Put your finger on the fourth string’s fifth fret to make a G note. Then alternately pluck the fourth string as well as the open third spring, turning the machine head of the third string ‘til the string (3rd) is in the synchronization with the fourth string’s 5th fret. Put your first finger on the third string’s 4th fret to make a B note. While keeping your first finger on the 4th fret, pluck the third string and the open second string consecutively, turning the machine head of the second string ‘til the second string brilliantly chimes with the third string’s fourth fret. Lastly, position your first finger on the 2nd string’s fifth fret and this will give you an E note. Make sure to tune the last and thinnest string to that by simply turning the machine head’s first string until the tone of first string sounds like the second string’s fifth fret. Based on the information provided above, there is no doubt, tuning a guitar is fairly easy. Hopefully, you had a great time reading this post and we hope this content has helped you a lot.